Always remember who you and whose you are no matter if the world tries to tell you otherwise or people attempt to persuade you differently. You have been wonderfully made, specifically purposed, and uniquely created. Who you are may evolve as the days pass along and life takes on new meaning, but your core essence will always remain. Whose you are, that will never change. “What’s in a name? That which we call a rose by any other name would smell as sweet.” ~ William Shakespeare None of us chose our parents, but one way or another, no matter how you slice it, they chose us. When they chose us, they also gave us a name – who we are. Our name identified us to others and to ourselves. Our name became a marker of who we are and made us accountable to everyone who preceded us and responsible to all that followed. We have our given name and our surname, the one we inherited as part of the family. As we carry our name, we also carry the legacy of our families and try to preserve what is best and build for the next generation. Who we are is the byproduct of the past, present, and future and despite what hell the world may throw in your direction, who you are will always be just as sweet. But whose we are, that is a completely different notion. We were chosen at birth by Christ and as a child of His, it is cemented whose we are. Whose we are is a direct correlation of our relationship with Christ and in order to have a relationship, you have to be in relation to the One who first chose you. Being in relation helps to clearly define matters as well, because when you truly know whose you are, the perils of life are not that daunting. When you know whose you are and stand firmly in that knowledge, you pray instead of panic, rejoice instead of regret, celebrate instead of criticize, worship instead of worry, knowing that all things are working together for your good and if it happened, God allowed it, and you will be the better because of it! Because we know whose we are, we have a level of trust and belief that surpasses all understanding and even in the midst of chaos and mayhem, we can still look to the hills and smile, knowing He that first chose us, is already fighting our battles. Remember who you are can be found in your given and inherited name and when combined with whose you are, you become an unstoppable force. Just as God changed Abram’s name to Abraham, “father of many,” and changed Sarai’s name to Sarah, “mother of nations,” He too has designed a destiny for you too. Wonderfully made, specifically purposed, and uniquely created – AMEN! 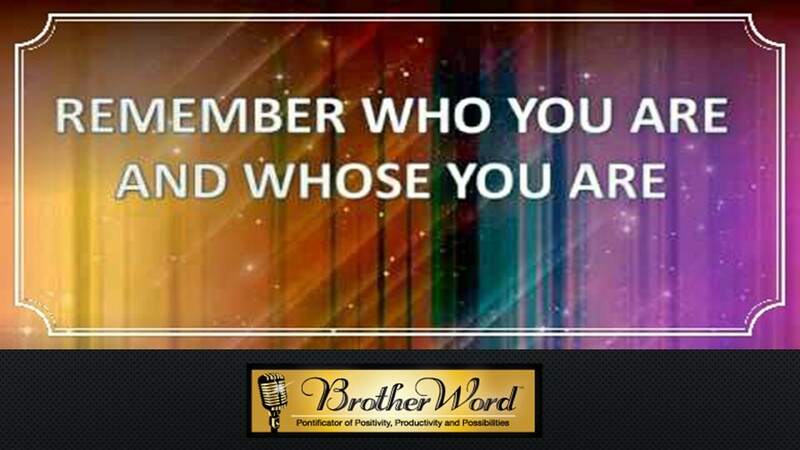 Thank you BrotherWord for another on time word and for this reminder. If we simply remember Whose we are it will help us see who we are and that is all the peace we need. It is comforting to know that who I am will change, evolve and take on new shapes and forms but my core will remain. Wow. Literally bringing tears to my eyes because often times change can be so difficult and it feels at times that you have lost yourself but you are merely evolving and changing into who you were truly meant to be – for the better. Even with such a scary feeling its so good to know that I belong to God and he is never changed. He is the same God yesterday, today and forever and no matter how many changes we go through, God is unchanging. Such a great word with a powerful messages that has given me a new perspective!